The quadriceps (thigh) tendon and patellar (kneecap) tendon are strong fibrous bands that attach the thigh muscles to bone making it possible for you to straighten your leg. The thigh muscle contracts and pulls the lower leg up. Small tears or inflammation (tendinopathy) of these tendons can cause pain with walking or daily activities. Large tears or complete tears can cause significant difficulty with walking due to inability to straighten the leg. Tendinopathy is often related to running and jumping sports and for this reason is often called “jumper’s knee”. Complete tears are often associated with a forcefully planted foot and a bent knee, such as with landing a jump or jumping up. Another cause can be a direct blow to the knee. 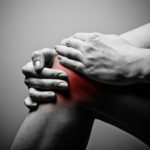 Symptoms and physical findings can include an indentation above or below the kneecap, a high-riding knee cap, pain, swelling, bruising in the front of the knee, thigh muscle cramps, and difficulty walking or feeling as if the knee will “give-way”. X-rays or MRI imaging may be ordered but the diagnosis can often be made based on physical exam findings. Tendinopathies or small partial tears can respond well to non-surgical treatments such as bracing for up to 3 to 6 weeks, guided therapy, and shockwave treatments. Complete tears require surgical repair to reattach the tendon to the bone and restore function of the knee. The sooner the tendon be repaired, the better the outcome. Delayed surgical treatment can result in shortening or scarring of the muscle which can result in a less favorable outcome. Rehabilitation after surgical repair can require 6-12 months of outpatient therapy and home therapy to regain strength in the leg.